Because Issy is terrible at remembering the actual names of the campgrounds we’ve stayed at, we have this “thing” where instead of remembering the name of a campground, we remember something memorable about it. For example – The campground where the lady fed us yummy spring rolls is, Sullivans Bay. The one where Elias packed a sad and needed to be picked up by his Father is Shakespear and the one where our tent got flattened in the wind is Wenderholm etc etc etc. So – Mita Bay shall forever be known by me “as the one where I ripped my fave shorts on that stupid nail when we jumped over the gate” and by Issy as “the one with the toilets that you could smell 10 million miles away” (btw, you couldn’t, she’s obviously exaggerating – but they were pretty unpleasant and I’ve smelt a fair few long drops in my time). 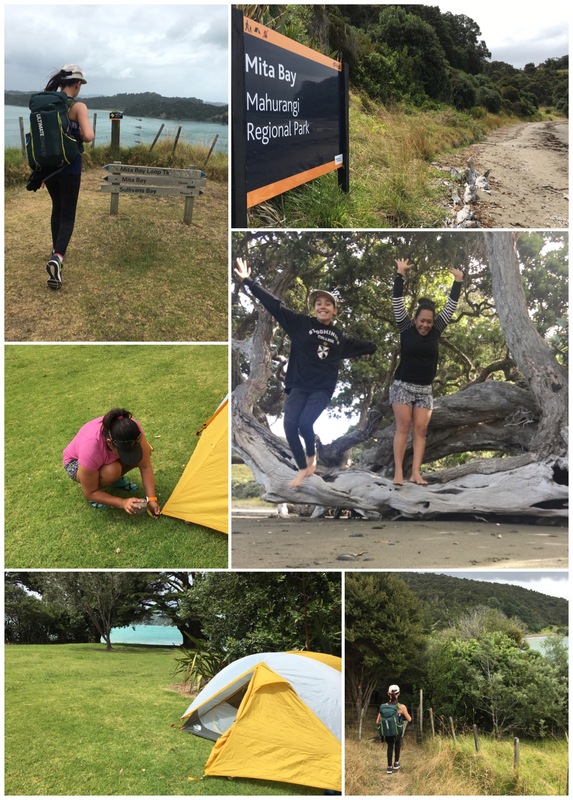 This also seems to be the campground were anyone under the age of 25 pitches their tents on the foreshore in a howling gale and where everyone over that age, tucks their little canvas homes in the shelter belts. When Issy asked why anyone would put their tent out in the open like that when it was so windy I explained it was probably for the Insta. Although in saying that – we had no cell coverage, so it would have to be a posted once you returned to civilisation (or I guess if you were really keen, you could walk to the top of the ginormous hill). I will mention again from the Tungutu Point lookout, the first 500m’s or so down to Mita Bay are an EXTREMELY steep descent, you could probaly just sit on your arse and slide down, not that I can actually confirm this because I’d already managed to rip my shorts by that stage and I wasn’t keen on shredding them to pieces. 😉 However thankfully once you cross the style and get into the bush cover it’s much easier going (and the shade and shelter makes a nice change from the open clifftops). The campground itself is really nice, every bay is beach front, there are loads of water taps dotted around the place and the shelter planting is mature enough to actually do the job which is fantastic when it’s blowing onshore like on the day we went. It was extremely sunny and hot in our little pocket of the campground but as soon as we stepped out from behind the trees it was freezing – which we soon realised we could use to our advantage, stepping out into the breeze to cool down and then basking in the sunshine next to our tent to warm up again – bliss!